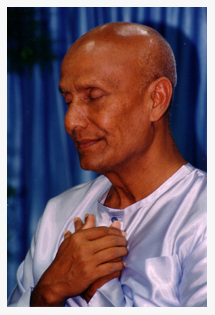 Sri Chinmoy – heart meditation. The spiritual heart is that place within each of us where our spiritual energies are most powerfully focused. In terms of its physical location, the spiritual heart is located in the centre of the chest – the place that we invariably point to when we say 'me' or 'I'. When we are beginning to learn meditation, we start by developing the capacity to concentrate – to harness, focus and simplify our mental and vital energies. Once this is accomplished, even to a small degree, we can then begin to meditate in the spiritual heart where we experience a spontaneous form of meditation that flows naturally from the heart space. Question: If we want to focus on the heart, where is it? The best kind of meditation is that which occurs naturally and spontaneously. We often see this occur in children who, although they may not be meditating consciously, frequently slip into stillness simply because their heart's are prevalent and their minds are not yet developed. In the spiritual heart, everything happens at a spontaneous level and is accompanied by sweetness, vastness, love, compassion, oneness and many other positive qualities. The spiritual heart is predominantly a place of expansion and oneness. The mind also has good qualities but is often bound by limitation and negativity due to our conditioning and the fact that we forget how to access our spiritual heart as we get older. Most people have meditated spontaneously during their lives. Inspiring situations such as when we find ourselves gazing into a fire or contemplating beautiful scenery can bring forward moments of clarity and stillness that we experience when the mind is absorbed in something vaster than itself. This is spontaneous meditation. However, when we practice meditation in a conscious and regular manner, we garner the capacity to make those moments a permanent part of our lives – we learn to dwell all the time in the spiritual heart and have a happy, simple, contented and progressive demeanour as a result. This enhances our individual human nature and adds a spiritual dimension to each and every aspect of our life and, by happy default, to the lives of those around us. In other words, we make the world a better place. Through his many years of teaching meditation, Sri Chinmoy constantly encouraged the ideal of living in the spiritual heart as being by far the greatest service that anyone can do for themselves or for humanity. When our own consciousness is improved in any way, the positive force that is released into the world environment as a result of our efforts spreads to other receptive soul's near and far in the form of encouragement, hope and joy – like ripples spreading out over a still pond when a pebble is dropped into it. The light of your heart. NB: The quotes and poem on this page are all by Sri Chinmoy.